This article is about a single from the soundtrack of Aladdin. For the Katie Price and Peter Andre album, see A Whole New World (album). For the young adult novel by Liz Braswell, see A Whole New World: A Twisted Tale. "A Whole New World" is a song from Disney's 1992 animated feature film Aladdin, with music by Alan Menken and lyrics by Tim Rice. A duet originally recorded by singers Brad Kane and Lea Salonga in their respective roles as the singing voices of the main characters Aladdin and Jasmine, the ballad serves as both the film's love and theme song. Lyrically, "A Whole New World" describes Aladdin showing the confined princess a life of freedom and the pair's acknowledgment of their love for each other while riding on a magic carpet. The song garnered an Academy Award for Best Original Song at the 65th Academy Awards. "A Whole New World" also won the Grammy Award for Song of the Year at the 36th Annual Grammy Awards, the first and so far only Disney song to win in the category. In 2014, Adam Jacobs and Courtney Reed performed the song as Aladdin and Jasmine in the film's Broadway adaptation. A single version of the song was released that same year and was performed by American recording artists Peabo Bryson and Regina Belle. This version is played over the film's end credits and is referred on the soundtrack as "Aladdin's Theme". The version peaked at number one on the US Billboard Hot 100 chart on March 6, 1993, replacing Whitney Houston's "I Will Always Love You", which had spent a then-record 14 weeks at the top of the chart. It went gold and sold 600,000 copies domestically. The track peaked at number 12 in the UK Singles Chart in 1993. The song is the first and so far only song from a Disney animated film to top the US Billboard Hot 100. The single version was later included on Belle's studio album Passion (1993) and on Bryson's studio album Through the Fire (1994). In 1993, a Latin American rendition of the song, "Un Mundo Ideal", by Ricardo Montaner and Michelle received airplay throughout Latin America. This rendition was later included on Montaner's greatest hits album Éxitos y... Algo Más (1993). In 2003, LMNT sang "A Whole New World" on Disneymania 2. In 2004, 98 Degrees member Nick Lachey and his ex-wife Jessica Simpson covered the song for the Platinum Edition of "Aladdin". Their version of "A Whole New World" was included on Disneymania 3 in 2005. In 2006, Peter Andre and his wife Katie Price released the album A Whole New World, which included originally private recordings from them. Their version of the song was also released as the album's lead single a month later. In 2007, Pixar employee Nick Pitera uploaded a video to YouTube where he performs both the male and female characters, earning 30 million views by January 2013. In 2014, Malaysian singer-songwriter Yuna performed a cover for a commercial promoting Disney's Aulani Hawaiian Resort. The cover was later included as a bonus track on the 2015 album, We Love Disney. In 2018, Riff Raff and Jonathan Hay created a hip-hop cover of the song for the album The Hoodlum Ball. ^ jambajuiced (9 February 2007). "A Whole New World Recording Session". Retrieved 27 March 2019 – via YouTube. ^ "Alan Menken, Howard Ashman, Tim Rice - Aladdin (Special Edition Soundtrack)". Discogs. Retrieved 27 March 2019. ^ "Peabo Bryson & Regina Belle - A Whole New World (Aladdin's Theme)". Discogs. Retrieved 27 March 2019. ^ "Best Original Song - The 65th Academy Awards (1993)". Academy of Motion Picture Arts and Sciences. Archived from the original on February 2, 2018. Retrieved February 15, 2018. ^ "The Hot 100 chart listing for the week of March 06, 1993". Billboard. Nielsen Business Media, Inc. Retrieved 2010-04-23. 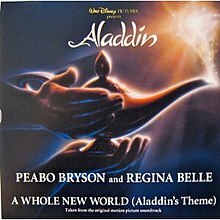 ^ "American certifications – Belle, Regina & Peabo Bryson – A Whole New World". Recording Industry Association of America. ^ "Best-Selling Records of 1993". Billboard. BPI Communications. 106 (3): 73. January 15, 1994. ISSN 0006-2510. Retrieved May 4, 2015. ^ a b "Official Singles Chart Top 100". Official Charts Company. Retrieved April 15, 2019. ^ "Passion - Regina Belle". Allmusic. Rovi Corporation. Retrieved 6 November 2014. ^ "Through the Fire - Peabo Bryson". Allmusic. Rovi Corporation. Retrieved 6 November 2014. ^ "Australian-charts.com – Peabo Bryson and Regina Belle – A Whole New World (Aladdin's Theme)". ARIA Top 50 Singles. ^ "Ultratop.be – Peabo Bryson and Regina Belle – A Whole New World (Aladdin's Theme)" (in Dutch). Ultratop 50. ^ "Top RPM Singles: Issue 1748." RPM. Library and Archives Canada. Retrieved April 15, 2019. ^ "Top RPM Adult Contemporary: Issue 1023." RPM. Library and Archives Canada. Retrieved April 15, 2019. ^ "Offiziellecharts.de – Peabo Bryson and Regina Belle – A Whole New World (Aladdin's Theme)". GfK Entertainment Charts. Retrieved April 15, 2019. ^ "The Irish Charts – Search Results – A Whole New World". Irish Singles Chart. ^ "Nederlandse Top 40 – week 5, 1994" (in Dutch). Dutch Top 40 Retrieved April 15, 2019. ^ "Dutchcharts.nl – Peabo Bryson and Regina Belle – A Whole New World (Aladdin's Theme)" (in Dutch). Single Top 100. ^ "Charts.nz – Peabo Bryson and Regina Belle – A Whole New World (Aladdin's Theme)". Top 40 Singles. ^ "Peabo Bryson Chart History (Hot 100)". Billboard. ^ "Peabo Bryson Chart History (Adult Contemporary)". Billboard. ^ "Peabo Bryson Chart History (Hot R&B/Hip-Hop Songs)". Billboard. ^ "Peabo Bryson Chart History (Pop Songs)". Billboard. Retrieved April 15, 2019. ^ "Peabo Bryson Chart History (Rhythmic)". Billboard. Retrieved April 15, 2019. ^ "ARIA Charts - End Of Year Charts - Top 50 Singles 1993". ARIA. Retrieved April 15, 2019. ^ "The RPM Top 100 Hit Tracks of 1993". RPM. Library and Archives Canada. Retrieved April 15, 2019. ^ "The RPM Top 100 A\C Tracks of 1993". RPM. Library and Archives Canada. Retrieved April 15, 2019. ^ "End of Year Charts 1993". Recorded Music NZ. Retrieved December 3, 2017. ^ "Billboard Top 100 - 1993". Billboardtop100of.com. Retrieved April 15, 2019. ^ "American single certifications – Regina Belle & Peabo Bryson – A Whole New World". Recording Industry Association of America. Retrieved April 15, 2019. If necessary, click Advanced, then click Format, then select Single, then click SEARCH. ^ "Discos más populares de Latinoamerica". El Siglo de Torreón (in Spanish). 20 August 1993. p. 44. Retrieved 6 November 2014. ^ "Éxitos Y... Algo Mas - Peabo Bryson". Allmusic. Rovi Corporation. Retrieved 6 November 2014. ^ Vaziri, Aidin (2011-05-09). "Pixar's Nick Pitera becomes YouTube singing star". San Francisco Chronicle. Retrieved 2012-02-13. ^ Guerra, Joey (January 24, 2018). "Premiere: Listen to Houston rapper Riff Raff on a remake of Aladdin tune 'A Whole New World'". Retrieved March 23, 2018. "Make It Like It Was"
Awards for "A Whole New World"